*It was a weird day of emotions today. I just felt off for some of the day, and I am not sure why. Then it kind of came back in the evening. I think some of it is the event surrounding Paul and I in our life. In different areas of our life, there are conflicts, and emotions are running high, and every day there seems to be something new. Maybe it is all just getting to me today. *There was a bright part of my day. The kids arrived this afternoon, and it is so wonderful to see them!! Molly, Travis and Cosette arrived to spend some time here in Kellogg during their spring break!! *This summer one of the additions to our yard will be a Narnia garden. The kids bought Paul a Solar Lamppost for his birthday, and a Aslan plaque. 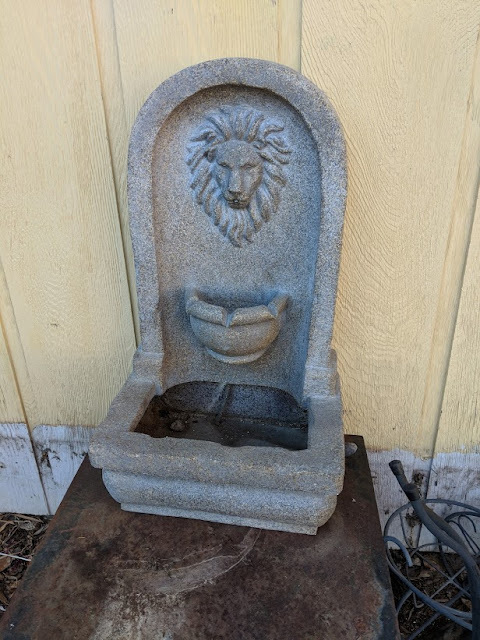 Last weekend he purchased an Aslan cement fountain to add to the garden as well. It will be fun to see how it all comes together. So one part of the yard is our Hogwarts garden, and now we will also have Narnia. Maybe after the Narnia Garden, we will create The Shire garden. *The weather was again beautiful today, and the snow continues to melt. I look forward to when Nikki and I can get out in the morning and start walking outside. We had taken a break while Nikki’s grandkids were here last week, and walked this morning and it felt so good. My body missed the walking!! *Cosette was working on her taxes this evening, and it reminds me I really need to get those done. Maybe now that I have typed it out, I will remember.